A few new books to recommend on the left sidebar. If you are using a newsreader I encourage you to click through to the blog and check them out. If you are interested in books that will stimulate your thinking these are a good place to start. I keep seeing products designed to help people keep track of food they have and items they need from the grocery store. Eventually, these products all have a business model that involves showing ads or printing coupons from the device. Seems reasonable. The latest one allows users to voice input information to add to the shopping list. If this type of technology is to ge serious it needs to be a seemless web connected service that can collect information in a variety of places from a variety of sources and output that information to the user at the time of need. Here's how I would see the grocery list service working. Solve Data Collection: Develop Wifi enabled networked barcode readers that attach to trash cans in the home. Users consuming food, healthcare or other merchandise scan the barcodes from packaging as it is discarded. This information is added to users shopping lists maintained on their home computers. Don't want or need a product replaced, don't scan it when discarding it. Data Management: On your home computer users see a list of products that have been consumed in the household. For advanced users household inventories are possible by downloading purchase records from the central service, scanning special format paper receipts, or scanning products when they arrive in the home. Shopping lists can be the basis of online ordering. Data Delivery: Users can request that their shopping lists be available for download into mobile devices. This enables users to download their current shopping needs when they are entering the grocery store. No more forgotten lists. Here's how the system looks in the real world. Susan is a busy executive with three growing teenagers. She was frustrated with keeping food and other necessities in the house as the kids kept eating and eating everything in site. Susan installed the List-o-matic system to help her with grocery management. She impressed upon the kids to use the system or she wouldn't be buying their favorite foods. Beyond that the system kept track of who was using it and provided discounts on products the kids liked as incentive to use the system. Each person in the home pushed a different button on the readers whenever they scanned a product needing replenishment. Susan found this helpful information so she could see the consumption patterns of her kids. The kids liked it because among other things they could automatically enter contests for their favorite soda. The system interfaced with the soda company website and automatically delivered their contest profile and product information to the contest interface. Susan could check to see what food items she had on hand before she left the office. Noticing that her husband had scanned the last package of toilet tissue this morning she decided she had better stop at the store on her way home tonight. Susan printed a shopping list but quickly forgot it on her desktop printer as she left the office. Not to worry she can download it again at the store since the store fully supported the List-o-matic system. At the store Susan could use her mobile phone to access her latest list but instead she used the cart based terminal. She preferred the larger screen display and the custom store optimization . The cart terminal used the store's Wifi network to connect to the List-o-matic service and download Susan's list information. The list was automatically arranged to the layout of the store. Susan's route through the store was optimised and step by step directions were given to her. At each turn Susan had the opportunity to see discount offers for competing or companion products. Buy a bunch of cereal get a discount for milk. Nice. Susan was glad she had set the auto-update option for the system because she noticed that a few items had been added to the list between her last viewing at the office and her version on the cart monitor. Turns out the kids had arrived home and finished off a few food items and the last three bottles of soda. No problem, Susan had them in the cart in no time. Check out at the store was not a problem as Susan had scanned the bar-code of each item she purchased as she loaded the cart. Her account was debited and a helpful store employee helped her load her car. Once home she accepted the inventory update email on her home system. The system reset the home inventories and waited until more products were disposed of and added to the list. As you an imagine there are plenty of places in a system like this that would allow the system vendor or third parties to insert revenue models and system add ons. Privacy concerns? No more than those already a part of existing systems. Protections and opt out could be built into the system. With proper incentives users could be encouraged to make their information and transaction information available to marketers in new and useful ways. 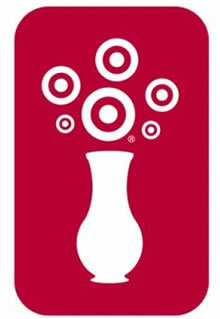 Design savvy Target is now offering these Bioplastic gift cards that are made of corn based plastic. Designed to appeal to echo conscious shoppers these cards are just one of many niche marketed cards. I don't see why all gift cards couldn't be made from sustainable products. In fact there was once a day when gift certificates were actually printed on paper. Imagine that! American mini-Wal-mart Pharmacy chain Walgreens continues to rubber stamp their retail stores all across the American landscape. Clearly Walgreens is a major benefactor of America's penchant for pill popping but that's another post altogether. The bottom line is that Walgreens is building an awful lot of flat roof space throughout the country. 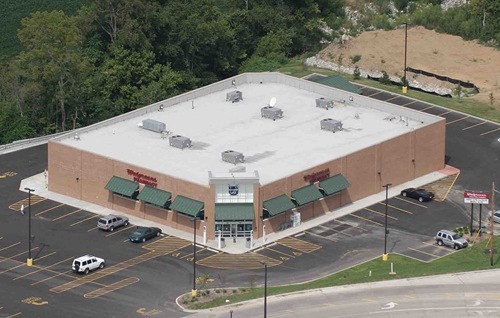 TreeHugger reports that Denver based ImagineIt is working with Walgreens to install roof top solar electricity systems on 114 facilities in California and New Jersey. The goal is for each system to generate upto half of the power needs for each facility. While in California it's saving electricity costs but in other parts of the empirecountry Walgreens may be interested in controlling their heating costs. As energy costs rise and solar system costs drop this is a trend to watch as rooftop real estate proliferates across the country. 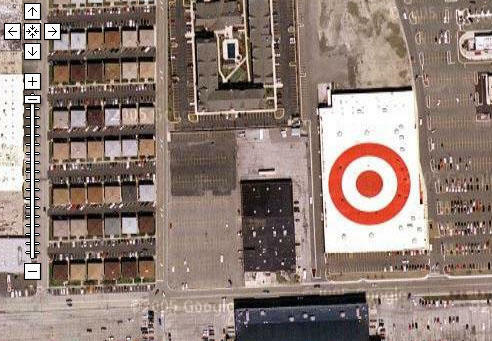 Painting your business name or logo on the roof of your building to advertised to airplane passengers overhead is nothing new, but painting a HUGE logo on the roof to be seen on Google satellite photos is new. 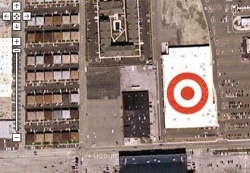 I don't know if that was the motivation behind this giant Target logo but it sure seems to be generating buzz. Imagine what kinds of things would be captured if people knew when the satellite/ariel photos were being taken in their area. As digital ink and printable electronic circuits mature we're going to see display screens in many new places. 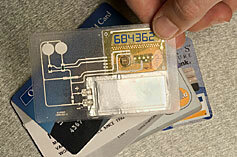 Here's a promising new technology of placing display screens on smart cards such as credit cards and gift cards. A display screen on a smart card can provide new levels of security and user feedback. Imagine a gift card that an display it's remaining balance. Very cool. I expect them to be pricey to begin with but scale will bring the costs down. Nice. Ever since the kitchen trash can earned a roll out cabinet of it's own and special cabinets for mixers and countertop appliances I new that sooner or later a kitchen cabinet company would look for innovative ways to encase other kitchen clutter. Now the dog bowls are sliding into their own special drawer. 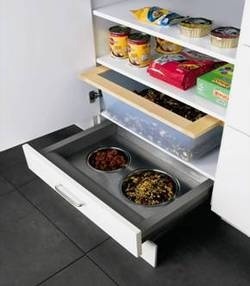 European cabinet company ALNO has introduced a new cabinet designed to hold dog food bowls and other dog related items like food containers. I would think that a special dog pull that allows dogs to open the drawer to access their food and water may be a good add to these drawers. Will we see a new trend as kitchen designers incorporate "dog centers" into McMansions from coast to coast? A lot is being written about digital photo printers these days. While most conversations center on the features and benefits of these printers and eventually all conversations lead to a comparison of the quality and costs of using a printer at home vs using a photo developing service like Walgreens, Wal-Mart or Costco. The bottom line is that it's true it's cheaper to download your photos to a photo finisher. But home photo printers are about lifestyle choices not cost savings. Having the ability to instantly print a photo at home enables a lot of lifestyle choices. That said here are a few uses that might have you considering a home photo printer if you don't already have one. Healthcare - If you have any sort of chronic condition or even a skin condition capturing a photo record you can share with healthcare providers is a excellent use for a home photo printer. You may not want to email sensitive photos to your doctor but hard copy prints that you keep in your files may be useful records for changes in your condition. Home Organization - The classic Polaroid photo tip for photographing your shoes and placing the photos on each shoe box is fast and easy with a photo printer. Same goes for other boxes around the home. Especially during a move a quick photo of the contents of a box tapped to the outside of the box can speed the search and find process after the move. Insurance Documentation - Documenting new jewelry, electronic, art , etc. purchases is quick and easy with a photo printer. Vehicle and property damage can be quickly documented. Family Life - Kids love pictures. Having a photo printer at home can enable all sorts of creative uses. Mom and Dad can have new pictures of their kids at work every week. Children can have pictures of Mom in their lunch. Grandma can get a quick picture of the cloths she sent jr. for his birthday. Kids can take and use photos in their schoolwork. Entertaining - Why not send people home from the party with prints of photos from the party. All of these functions can be done with a conventional photo finisher but the issue really is time and convenience. The printer marketers know this. Witness the effective HP commercials featuring the kids in their parents photos begging to get out of their digital cameras. People love to take pictures they don't always like to take the time to develop them. A good home photo printer can change that. Here's an interesting idea. Recently an entire generation of the classic double decker busses have been retired from the streets of London, UK. These old icons aren't wheelchair accessible. Now comes a group called Double Decker Homes that is working to convert these buses into stylish two story homes. Bus conversions are nothing new of course but what a great way to get some great mobile dwellings for all sorts of uses. Way to go London. 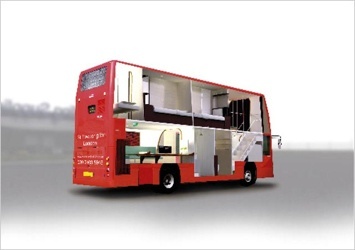 I still think double decker busses have a place in the emerging experience economy. I have posted a good use for a vintage double decker bus before. Baseball caps have been banned from a chain of internet cafes in two Scottish cities, it has emerged. Easyinternetcafes - owned by Stelios Haji-Ioannou, the founder of low cost airline Easyjet - claims the headgear is linked with "deviant" behaviour. The ban on wearing caps is to be piloted at the chain's branches in Edinburgh and Glasgow. If the trial is successful, it will be introduced in all 41 Easyinternetcafes across the UK. The chain's management claimed people in baseball caps made other customers feel uncomfortable and that wearers were difficult to identify on CCTV. James Rothnie, the firm's director of corporate affairs, said the ban had been introduced after a spate of thefts. He told The Sunday Times: "We want to make sure that our cafes are places where customers can relax and feel secure. "Since deviant behaviour can be associated with the wearing of baseball caps we are politely asking people who enter our premises not to wear caps. "This policy is designed to combat anti-social behaviour such as theft." Is this discrimination or are public business' entitled to welcome any dress regulations?